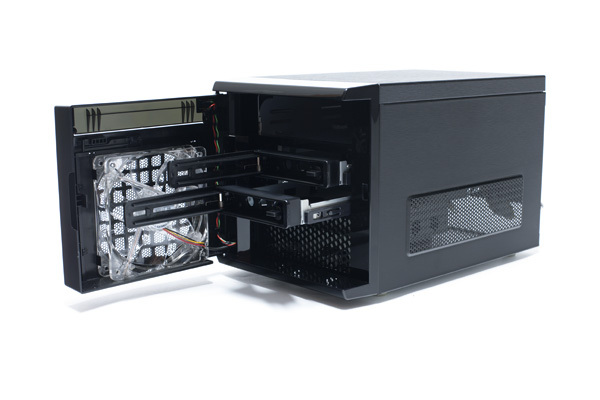 German brand EOLIZE announcing a new Mini-ITX Case. New EOLIZE SVD-NC12-02 Chassiscomes from a upgraded SVD-NC11-02 Mini-ATX Case. EOLIZE improved the SVD-NC12-02 by adding a 120 mm axial fan and reworked flat front panel. It furthermore aims for private and corporate customers who are looking for solid and reliable NAS as well as Home Server chassis. It has much in common with a Barebone chassis and can be used as such but offers additional features such as Hot Swap Modules. Both Hot Swap Modules are located behind the decently designed front door which are able to fit two either 3,5 inch (8,89 cm) or 2,5 inch (6,35 cm) drives such as HDD or SSD. 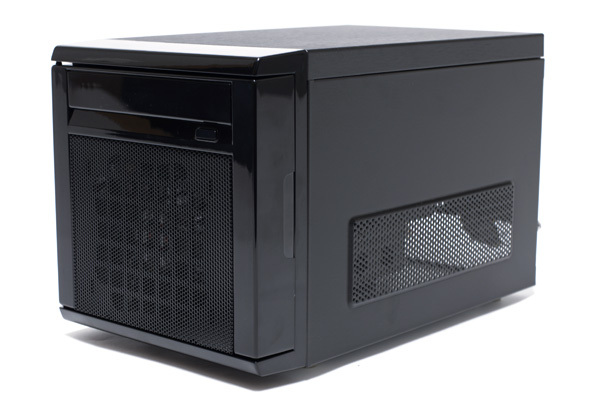 One further 2,5 inch sized HDD/SSD may be mounted inside the SVD-NC12-02 Mini-ITX chassis. This drive can be used as a system drive to install an appropriate Operating System and additional Software. Additionally one 5,25 inch (13,3 cm) bay is located in the front giving enough space for a DVD, CD or Blu-ray drive as well as other commonly used bay accessory. SVD-NC12-02 Mini-ITX Chassis is furthermore equipped with an I/O panel in the front offering two USB 2.0 connectors, one Mic and one Audio-out connector. To avoid heat accumulation appearing inside the Mini-ITX chassis one 120 mm and one 80 mm axial-fans were built-in. The 120 mm fan is located inside the front door to bring in fresh air from the outside as well as permanently cooling down the two Hard Drives mounted in the Hot Swap Modules. On the rear side one 80 mm axial-fan is mounted to exhaust the hot air created by various components inside the chassis. Hence creating a constant airflow avoiding any heat accumulation. Similar to the formally announce EOLIZE SVD-NC11-2 Chassis, new SVD-NC12-02 Mini-ATX Chassis comes with a pre-mounted SFX Power Supply Unit rated with 300 Watts power output. 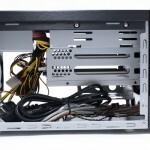 To supply the hardware with required power it is equipped with one 24-pin ATX Connector, one 6-pin PCI-Express connector, two 4-pin P4 connectors, two 4-pin Molex and three SATA connectors. All these features are allowing this chassis to be used for multiple purposes such as Barebone, NAS-, File- or even Home-Server for comfortable Data-Storage. 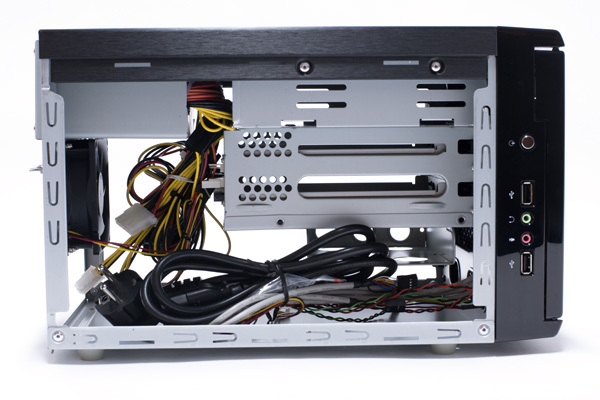 EOLIZE SVD-NC12-02 Mini-ATX chassis is available for 99,00 EUR (incl. VAT/TAX) in the official EOLIZE Shop and can be purchased from other European Online Shops as of today. EOLIZE is a young brand which was has it root in Germany. Focus of the brand EOLIZE lays on High-End Mini-ITX, NAS and Home Server Chassis as well as other relevant products. Product range is available throughout the European Union, Ukraine and Russia. It is furthermore possible to obtain the EOLIZE products in the official Online Shop of the brand allowing direct access for end-users as well as resellers and corporate customers.